Let's Go Fly A Kite - A Comparison Kite! Comparisons are something that I call "thinkers" - if someone quickly asks you if a watermelon is harder than a banana, you might take a beat to answer. For some of our students, even taking a second to think about their answer might not help. Address teaching comparisons and that fateful "than" word using this fun, spring-themed game! 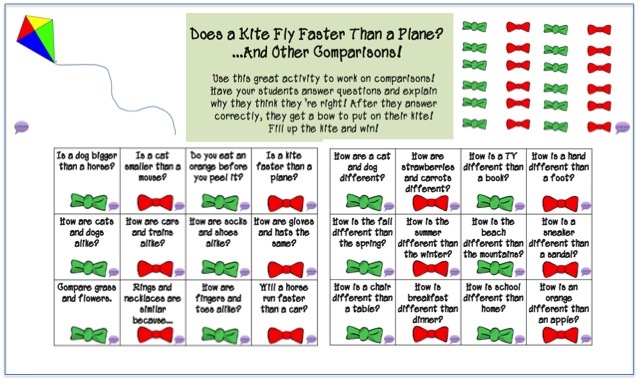 "Comparison Kites" is a great game you'll be able to use for a session, or even quickly play at the end of a session. Print out the kite and the bows as a reinforcer for correct answers! Then ask the comparison questions and have your students explain why their answer is correct! 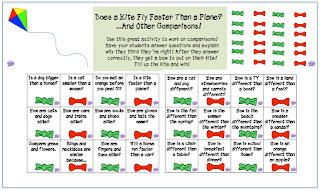 So go fly a comparison kite and have a blast! Download this fun activity HERE!